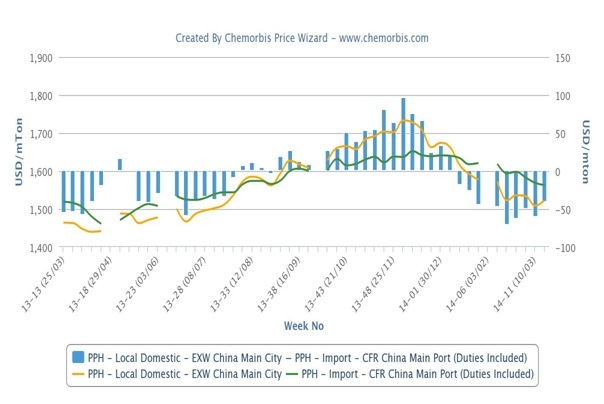 China’s PP market has been steadily moving lower since the beginning of the year despite a short period of stabilization owing to unsatisfactory demand and mounting stocks as per the pricing service of ChemOrbis. These factors, particularly the state of oversupply, are likely to continue to drag PP prices lower both in the local and import markets, report players in the region. A distributor in Yuyao said, “There is still around 1 million tons of PP and PE in the local warehouses. In addition, the bonded warehouses and ports are almost full of previously secured materials.” The upcoming start up of Sichuan Petrochemical’s 450,000 tons/year PP plant will further exacerbate the supply imbalance, according to players. The oversupply concerns remain in place despite the regional producers’ efforts to reduce availability by lowering their run rates or shutting down their PP plants in March-April period. According to players, buyers and distributors are not interested in securing import cargoes at the moment in China as local prices are offering a more attractive option for them. “We are not feeling confident enough to buy from the import market as we don’t want to operate with negative margins,” commented a distributor. 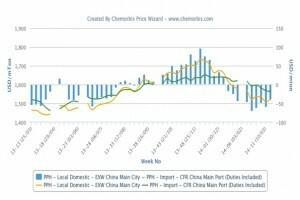 The domestic PP market has been once again trading below the landed cost of import cargoes since the return of players from the holiday in early February, as can be seen from the ChemOrbis Price Wizard graph below. Hence, domestic producers have propped up their prices on the low ends of the ranges in an attempt to slow down the decreasing trend, players reported. According to ChemOrbis, an agent of another Saudi producer also expressed their April sell ideas for PP block copolymer with $10-30/ton decreases for April pointing to the buyers’ arguments about finding more competitive prices in the local market. “Stabilization in prices is unlikely before the stock pressure inside China eases,” commented a trader.